This is first installment of “Fourth World Under the Nuclear Cloud,” a four-part series published by Intercontinental Cry Magazine that draws on preliminary results from the crowdfunded Radiation Exposure Risk Assessment Action Project by the Center for World Indigenous Studies (CWIS). Millions of indigenous peoples living in Fourth World territories around the world have been and continue to be exposed to nuclear radiation and toxic chemicals. The United States of America, France, Britain, Russia, China, Israel, Britain, Pakistan, India, and North Korea produce these toxic materials. Other countries with electricity-producing nuclear reactors also contribute to radioactive waste. Nuclear bomb detonations, radioactive waste storage sites and toxic chemical dumps have contaminated the soils, water, air, plants, animals and people for more than 70 years. In their wake they leave intergenerational health and cultural damage to Fourth World peoples rarely noticed by the public eye. The story of this generational disaster begins with the US government’s secret Manhattan Project when in 1943-45 the first nuclear bomb code-named Trinity was developed and tested in Mescalero Apache territory at Alamogordo, New Mexico. After dropping a bomb on the cities of Hiroshima and Nagasaki, Japan in 1945 the United States constructed what became the most radioactively contaminated site in the world at Hanford, Washington. 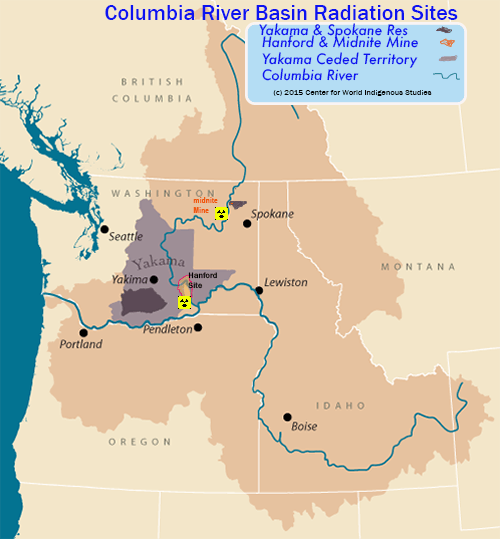 Hanford plutonium reactors were constructed in the Confederated Tribes of the Yakama territory. In 1950 the Midnite Uranium Mine was opened on the Spokane Indian Reservation; the neighboring Fourth World nations (Confederated Tribes of the Colville Reservation, Nez Perce, Umatilla and Confederated Tribes of Warm Springs Reservation) bound to them by the mining project’s radioactive reach. The United States did not seek public opinions or debate about government plans to create the world’s first nuclear weapons. The secretive Manhattan Project was launched to develop an atomic bomb. Secretary of War Henry L. Stimson, (a Republican serving under President Harry S. Truman) commissioned Hanford in 1943 to produce the extremely radioactive plutonium for the US government. Classified government research projects were first located at three public universities (Columbia University, University of Chicago, and University of California at Berkeley). Three custom-built facilities were constructed at Oak Ridge, Tennessee, Los Alamos, New Mexico and Hanford, Washington. In total, over 2 billion dollars ($17,7 billion in 2015 USD] was spent on nuclear war research and development. The estimated cost to the current and intergenerational health of peoples, lands, culture and waterways, however, is still unknown. The US government selected lands in the Yakama Nation’s territory characterized as “barren”. It was an ideal site for the nuclear reactors that would provide easy access to the Columbia River’s fresh water. 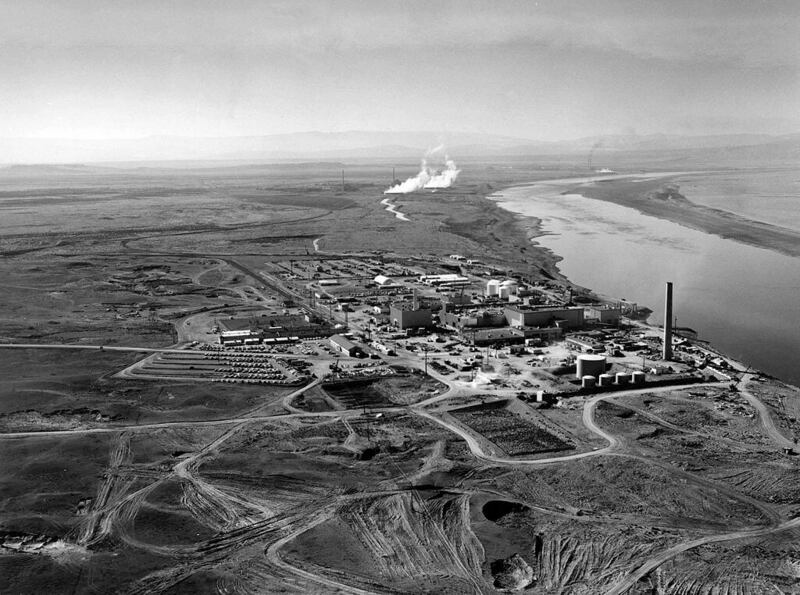 Hanford reactors were built on and used the surrounding land and a 50-mile stretch of the Columbia River to produce war grade materials. In most cases the 50,000 workers at the site did not know they were working to build three nuclear reactors. Just 18 months after breaking ground for the plutonium reactor the US military dropped an atomic bomb on Japan’s Nagasaki. The 1985 Nobel Prize for Peace recipient Physicians for Social Responsibility reported that radioactive wastes were buried in the soil and dumped into the Columbia River. High-level waste was stored in single-shell storage tanks while the plutonium reactor was constructed. Hanford reactors refined 60 percent of the plutonium produced by the United States government and eventually closed the reactors down retaining the site for depositing more nuclear waste. The United States continues to add to this deadly mix of radioactive materials and toxic chemicals to this day. Human industry has many good and important qualities. Most human industry helps the quality of life. But, almost any and all human activity produces a byproduct—waste—that can damage the livability of human society. Human industrial waste does not generally concern communities when there is a working waste disposal program. Organized disposal takes unwanted leftovers to a disposal site and safely buries or incinerates it. But, what if the waste created in one place is then taken to your backyard and buried without anyone asking for your consent? And, what if that buried waste becomes lethal to life? What if it contaminates soil, plants, animals and people? Contaminating waste becomes a big problem. That is precisely what happened to the Yakama Nation along with 1.9 million non-tribal people in the Columbia River region. Since the US began uranium mining on the Spokane Reservation and bomb making in Yakama ceded territory it has created the most radioactively contaminated region in the world. With the construction and later decommissioning of nuclear power plants the disposal of spent radioactive fuel rods has added to the radioactive waste. The Hanford Nuclear waste site that receives radioactive materials from around the US and from some countries stores waste near the banks of the Columbia River. This places the peoples of Yakama and those living on the Yakama and Columbia Rivers in a state of indefinite danger. The Spokane Indian Tribe has the 350-acre Midnite Uranium Mine located inside its territory. The mine was originally opened in 1950 and is now closed [See Columbia River Basin Radiation Sites above]. The Midnite Mine was opened to support the U.S. nuclear arms race with the Soviet Union. It is now the site of 35 million tons of radioactive waste rock and uranium ore. According to Spokesman Review reporter Becky Kramer the dormant Midnite Mine will require at least a decade to “clean up.” The managing company Newmont and its subsidiary Dawn Mining have the contract to perform the clean up at a cost of $193 million. Wastewater (monitored for radioactivity) is being discharged into the Spokane River that in turn, feeds into the Columbia River. The Yakama nation reserved territory and ceded territory hugs the middle of the Columbia River. This is where Hanford’s engineers dumped 400,000 gallons of radioactive water and buried radioactive waste under ground. Yakama’s governing Council is concerned with the effects of Hanford on its reserved 2,031 square mile territory as well as the ceded territory. The Yakama government regards locating the contaminated Hanford site in their territory as a violation of the Yakama/US Treaty of 1855. The Yakama has 10,851 members and another 20,000 residents. Its territory is larger than the states of Rhode Island or Delaware and half the size of Connecticut. The United States government without the consent of Yakama’s government created the Hanford plutonium reactor in an atmosphere of intense secrecy. And then the US made the site a radioactive dump. Medical, genetic and social researchers have attempted to understand the complex public health effects of exposure to radioactive elements. Researchers conducting human subjects experiments repeatedly conclude that radioactive exposures cause many serious health problems. Various types of cancers, tumors, genetic mutations, congenital malformations, heart failure, gastrointestinal disorders, immunological dysfunction, and infertility are the common results. For Fourth World peoples, these risks overlap the destruction of culture and heritage, natural resources and and denial of their human rights. Contaminated plants, water, animals, and soil in the world’s nuclear “hot spots” are also the foods, medicines, and sacred places. As with any human society these are central to indigenous religions, cultures, identities, societies, economies, and knowledge bases—life. Thus, the burden of nuclear contamination essentially destroys these life-supporting resources and amounts to cultural genocide, or culturcide. These consequences are particularly acute on the Spokane Indian Reservation, parts of the Confederated Tribes of the Colville Reservation and the Yakama. Radioactive substances carry uniquely dangerous characteristics compared to other toxins made by human industry. When nuclear technology was first being developed, researchers quickly discovered that radioactive isotopes had a “super-poisonous” quality. They destroy cells, damage the immune and digestive system, and accelerate aging and death. Radioactive isotopes accumulate in different organs of the body, including the lungs, thyroid, or kidneys. There, they trigger growth of cancerous cells. Worse, the consequences are far-reaching: they cause trans-generational harm through genetic alteration. Anyone exposed to the fallout of nuclear accidents, waste disposal or tests may experience any number of consequences including increased cancer rates, birth defects, severe cognitive disabilities, premature aging and death. Thyroid cancer and leukemia are among the most common cancers associated with radiation exposure. It is also an established cause of cardiovascular disease and solid tumors. However, It is not just high-levels of radiation exposure that are dangerous. As early as 1956, a report commissioned by the US Atomic Energy Commission (AEC) found that even low-levels of radiation could cause harmful genetic changes in individuals and in entire populations with significant trans-generational results. In a recent major World Health Organization study, scientists pointed to the emissions from nuclear power plants as a specific source of potential increased cancer risk—particularly from disposed spent radioactive fuel rods. Nuclear weapons, electrical power reactors and radioactive materials waste disposal results in the contamination of surface and subsurface water and soil with substances such as radioactive plutonium, uranium, strontium and cesium. These materials increase mutations, and they remain harmfully toxic for thousands or even millions of years. Accidents at nuclear power facilities have resulted in decreases in regional animal and plant populations and damaging food sources, water sources and entire ecosystems. Studies conducted around Hanford, Washington revealed that even small concentrations of nuclear waste damaged plants, contaminated soil, and rendered edible crops dangerous to eat. To date, the only containment “solution” is to bury the waste. However, burial is neither safe nor predictable, since there are no successful ways to dispose of waste or remediate contaminated sites. Various amounts of radioactive materials continue to be found in animals, soils, plants, and water near storage and production facilities. Studies suggest that protracted exposure to nuclear waste has resulted in genetic and epigenetic mutations in wildlife. The continuity of cultures in nuclear zones is an unstudied topic. The dynamic relationship between a people, earth and the cosmos is dramatically interrupted when the catastrophic introduction of nuclear radiation and toxic chemicals lays waste on a society. Fourth World nations across the globe repeatedly insist that the states responsible for the contamination of their territories have failed to clean up contaminated sites or to prevent further damage. Even where state’s government bodies have tried to manage the health risks of radioactive contamination, they have done so in ways that neglect harmful consequences to cultures. Some state’s governments use risk avoidance strategies to reduce or prevent damage to people’s health. In northwest United States, for example, the US Department of Ecology uses fish consumptions rates to prevent people from eating irradiated fish—telling the public not to eat high levels of fish to avoid cancer risks. Instead of cleaning up the waste, or preventing its storage in the first place, avoidance warnings ask Fourth World peoples to stop using foods and medicines, even though they are core aspects of their cultures and community. The Yakama Nation and her neighboring nations (Spokane, Confederated Tribes of the Colville Indian Reservation, Nez Perce, Umatilla and the Confederated Tribes of the Warms Springs Reservation) are in the reach of the Hanford Nuclear Waste Site and the Midnite Uranium Mine. 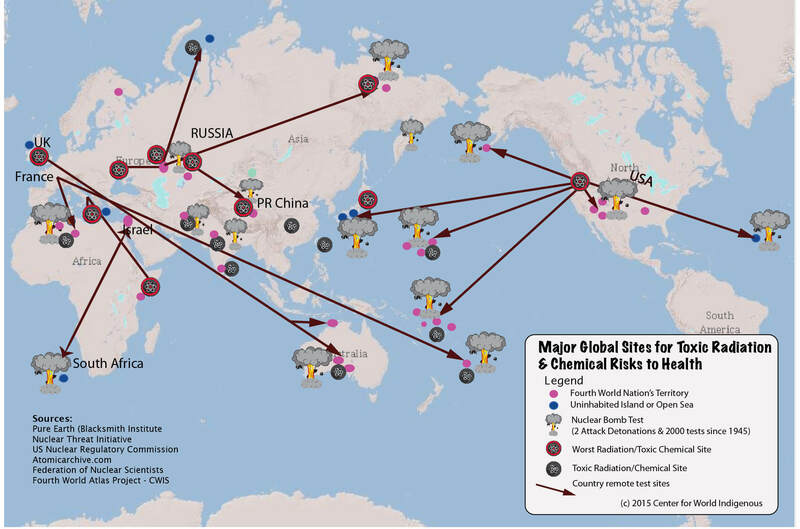 There are six other highly radioactively contaminated sites in Fourth World nation territories worldwide and many more storing spent fuel rods from nuclear power plants as well as radioactive hospital waste. Figure 2 Nine states detonated more than 2150 nuclear bombs since 1945 and dumped waste in Fourth World territories into the present after most bomb tests ceased. An estimated total of twenty additional Fourth World territories in Asia, Europe, Africa, the Middle East, North America and the Pacific Islands similar to the Yakama, Navajo and Shoshone territories in the US function as sites for the detonation of nuclear bombs, and as storage sites for nuclear waste, and toxic chemicals. The United States government and contracted waste management companies have located up to six hundred radiation and toxic chemical waste sites on Indian reservations leasing their land for that purpose. Locating waste disposal sites in these ways easily resulted from legal loopholes Fourth World territories provide—as spaces where state and international laws regarding environmental health and nuclear waste can be circumvented or laws are non-existent. The nuclear states (United States, Russia, France, Britain, China, Israel, and India) avoid testing weapons or storing radioactive and toxic waste on their own lands. They rather favor territories with relatively low-density populations and limited internal governmental regulation while generally avoiding obtaining informed consent or authorization from the affected communities. Significantly none of the bomb making and waste producing states considered in advance of developing plutonium reactors for bombs and electrical generation how to dispose of the waste safely. Despite all of the technological capabilities making radioactive materials no similar effort was early on developed to control the adverse effects of waste products on life. 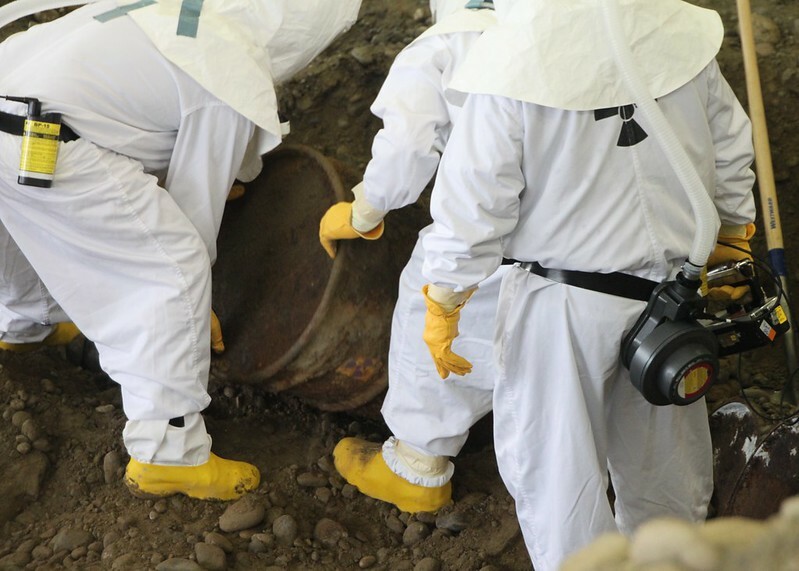 Burying radioactive waste with the probability of unanticipated emissions and leaks remains the method for disposing of the deadly materials. The French government detonated thirteen nuclear bombs in Tuareg territory (Algeria) in the 1960s. They released radioactive gases into the atmosphere and spread radioactive molten rocks across the land. These events exposed Tuaregs to high levels of radiation. No study to date has been conducted to determine the effects these exposures may have on the health and intergenerational lives of the Tuareg. 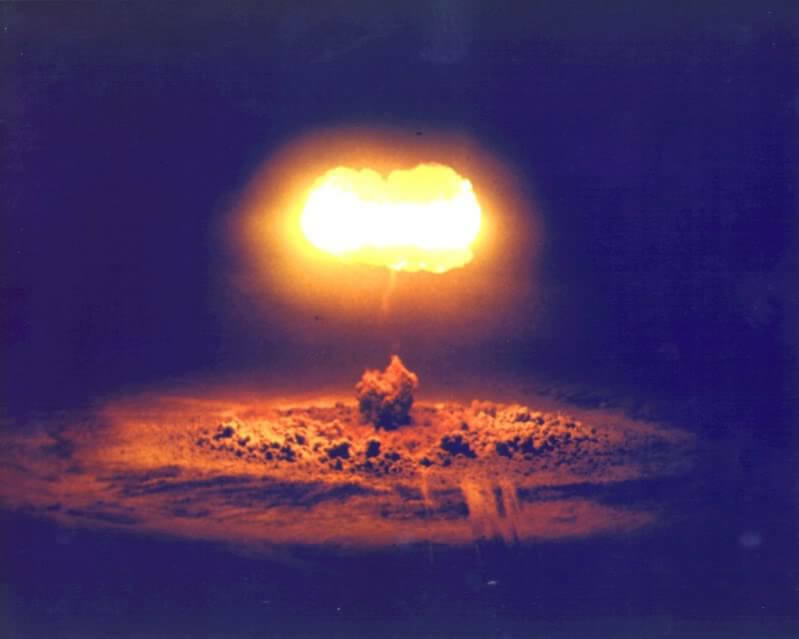 Kazakh territory on the steppe in northeastern Kazakhstan was the place for hundreds of atmospheric and underground nuclear tests conducted by the Union of Soviet Socialist Republics (Russian Federation is the successor) in the 1940s. Studies conducted years later determined that more than 200,000 Kazakh’s and other local residents were exposed to intense radiation. These exposures resulted in high rates of cancers. No follow-up epidemiological studies have been conducted to assess the intergenerational consequences of radioactive exposures. The Uyghurs, Hui and Tadjiks in China’s northwestern Xinjiang province were exposed to atomic radiation in 1964 and thermonuclear detonations in 1968. The People’s Republic of China established Uyghur territory as its prime nuclear test site. At least two generations of Uyghurs, Hui and Tadjiks (a population of 10.95 million) may continue to experience the effects of radioactive and toxic waste exposures. The Pakistani government conducted nuclear detonations in 1998 in Baluchi territory at Ras Koh Hills. The Baloch Society of North America and Friends of Balochistan organized protests at the Pakistani Embassy during the detonations to call attention to the “heinous crime committed against our people.” The Indian government conducted its first nuclear detonation in 1974 and continued nuclear test in 1998 in Rajastan the territory of Bhil. Britain conducted atmospheric tests in the 1950s in the Maralinga home of the Pitjantjatjara and Yankunytjatjara. Studies on these peoples were truncated. They did not result in any conclusions about exposure effects on health and genetic changes. The United States of America conducted more than 1100 nuclear detonations in the atmosphere, underground and aboveground (1944-1998) and nuclear waste dumps solely in Fourth World Territories. Marshal Islanders, Paiutes, Shoshone, Kiribati, Yakama, Spokane, Navajo, Mescalero Apache, and Aleutes are among the peoples directly affected by US radiation releases from 1943 to the present. The Taiwan government through the Taiwan Power Company (Taipower) stores 100,000 barrels of high level nuclear waste from the island country’s three nuclear power plants. Storage was located at the Lanyu nuclear waste storage facility built in 1982 on the territory of the Tao (also known by the Japanese name as Yami). The Tao are a fishing people who have occupied their island (Ponso no Tao meaning “island of the people” [Orchid Island]) for at least a thousand years. In 2002 and 2012, there were major protests by the Tao, calling on Taipower to remove the nuclear waste from the island. The Yakama Nation and the Spokane Indian Tribe along the Columbia River host the most radioactively toxic region in the world. The Mescalero Apache are the first Fourth World nation to experience an atomic bomb detonated in their territory. Now many Fourth World nations live in irradiated territories under the nuclear cloud. In the name of “national security” all of the nuclear governments have maintained a policy of deliberately not informing residents of Fourth World territories in advance of nuclear tests. Human subjects experimentation using radioactive materials on native peoples, and siting of nuclear waste dumps go on without consent. No epidemiologic studies been concluded to determine exposure effects on health or cultures. Indeed the US Atomic Energy Commission (AEC) records predating 1974 documenting tests, human subject experimentations and radiation exposures have mysteriously disappeared. All records from 1974 remain top secret and not available for scrutiny outside the AEC or its successor the US Department of Energy. Yvonne Sherwood is a member of the Yakama Nation. She is a doctoral student at the University of California, Santa Cruz in the Department of Sociology (with an emphasis in feminist studies). She is a UCSC Dean’s Diversity Fellow from 2011 to 2016 and was advanced to candidacy for her doctoral degree in the fall of 2015. Prior to graduate school, Sherwood was an active student leader who served as an officer for Indigenous Resistance Organizers, M.E.Ch.A.,, and Yakima Valley Community College Tiin- Ma. She also allied with EWU Pride, EWU Black Student Union, and Spokane’s Peace and Justice League. Sherwood is currently a research intern at the Center of World Indigenous Studies where she is Co-researcher on the Radiation Risk Assessment Action Project with Rudolph Rÿser, PhD. During her time with CWIS her focus is on social analysis and community organizing. Janna Lafferty is descendant from the Irish and Northumbrians. She holds a Master’s degree in Religions from Duke University. She is a doctoral student in the Department for Global and Sociocultural Studies at Florida International University with concentrations in critical food studies and cultural geography. Lafferty served as co-editor of the Anthropology and Environment Society’s Blog, which features first-hand accounts by social scientists engaged in environmental issues. Her work has centered on social and environmental change, social justice, food and environmental justice, nature-culture relationships, and the ongoing legacies of colonialism. Ms. Lafferty is a research intern on the Center for World Indigenous Studies Radioactive Exposure Risk Assessment Action Research Project.